Q. How do you feel now? RAFAEL NADAL: Okay. For sure not perfect. Same way that I felt before. A little bit more dizzy now. But that's it. Nothing that I have to worry about. Q. Did you feel the two days in bed earlier this week caused you to lose some power tonight? Did you feel weaker in any way? Q. Can you tell us how it affected your play tonight. RAFAEL NADAL: Is not the moment to talk about that. We talked about that yesterday. When you lose a match, is not the moment to talk about obvious things. I lost. Feli played better than me. That's it. I talked about that yesterday, so I don't need to talk again about my health. The only thing I have to say is that I am not very, very bad after the match. That was a little bit of risk. The risk is under control, so happy for that. 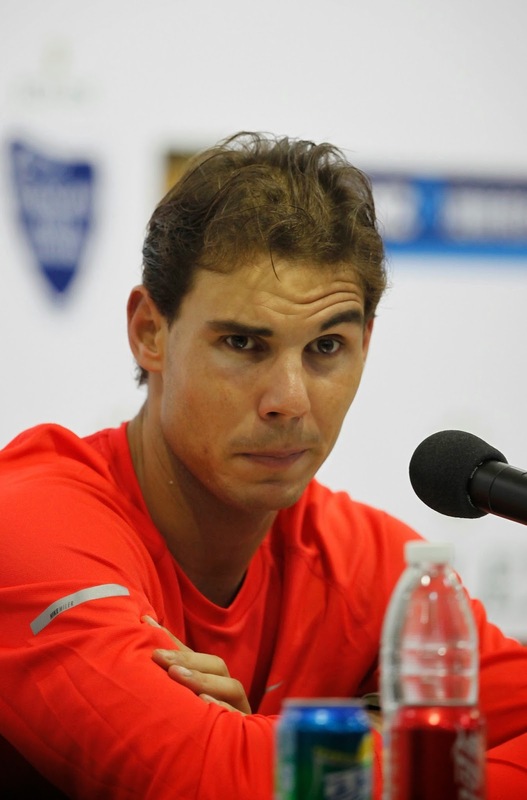 Q. Rafa, as you said yesterday, you were hoping today you would feel better, then you would be able to get on the court. Is it correct to assume that you feel better today than you felt yesterday physically? RAFAEL NADAL: I feel similarly than yesterday. I had to take a lot of antibiotics for the last four days. Little bit aggressive ones, was inside straight (indicating intravenously in the arm). For sure is not the best situation. The thing that I was more worried about play the match is I had some injuries in my career, but strains in the muscle I only had three times, and two of them was after the process of antibiotics. These ones were more aggressive, so I am happy at the end that I didn't have nothing worst after the match. Q. You were complaining about the ball last week in Beijing. What do you think of the balls that are used here? Do they take topspin as much as you want? 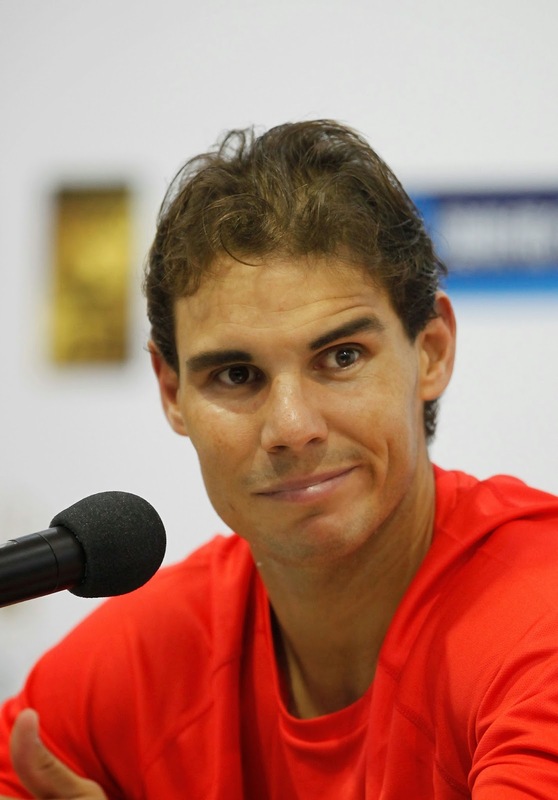 RAFAEL NADAL: I don't want the ball to help me to play better. I want a good ball. This ball is probably not the ball that helps more to my game, but is a good ball. So that's fair enough for everybody to play with a good ball. For me the ball of last week is not a ball with the conditions of a very important tournament of the ATP World Tour should be. But the ATP thinks different way than most of the players. I don't know if they know about tennis, about the feeling of the ball. Sure they know about the tennis, the story of tennis. The ATP is very important. I don't know if they know about the feeling of the ball. If a lot of players say the same to them, probably they have to think about. Q. You said yesterday you thought that you will need an operation. Have you thought more about when you might have that? RAFAEL NADAL: Yes, I need to do the surgery. I talked with the doctor in Spain. Is a lot of risk when that happens one time. Even if now is under control, is obvious going to come back. I don't want to come back, to have the same thing when I am in Australia, when I am in Indian Wells or Miami or when I am in Roland Garros. So I going to do it before the end of the year. Q. Do you think that will mean you will not play again this year? RAFAEL NADAL: No, no, I don't mean that. I don't know. I don't know yet today. My feeling today, and my answer today honestly is I going to do it after the World Tour Finals. You never know. Depends how the things improve. I want to do it at the end of the year, not now. Q. Do you mean that you will continue your schedule and keep on playing, or you will change your schedule and take some rest? What is your plan for the days after Shanghai? RAFAEL NADAL: Sure without think a lot about, because when you are on the bed for three days, the only thing you want to do is feel better, feel healthy again, and that's it. But my thoughts is continue with Basel, Paris and London. Is true that the last few months I was not in the best of luck. I didn't have the best of luck since Wimbledon. I was playing a good year, very positive year. After that I was unlucky with the wrist, what's going on now. Now remain three more tournaments for me. We'll see. Obviously the last couple of months have been little bit hard for me. Q. When you served for the second set, there were guys on the stand yelling out. Were you disrupted by them? RAFAEL NADAL: No. I am distracted by my bad game, not by nobody else. Q. You said your condition was almost the same as it was yesterday. Does that mean you're still in some pain, a little bit of pain, still? RAFAEL NADAL: Little bit of pain. But that's not the tougher thing now. Tougher thing always, as you know, when you have few days in bed, the process that I had, even today the doctors told me that I was very, very lucky that I had not to go for surgery straight, can save with antibiotics. You can imagine that all the treatment was little bit aggressive at the beginning. In three days I am playing. I am little bit more dizzy and feel with not much power than pain. Pain I think is under control. That's important. I think I was lucky for that. Unlucky for another things, but for this thing I was lucky.